A high fidelity simulation in the AW 139 aircraft. The initial assessment was performed at a scene outside pub. Initial plan: package the patient for a 30-minute air transfer to the children’s hospital (a major trauma centre). Do you land or continue to destination? What guides this decision? How can space/access to the patient be improved in the AW 139? Traumatic cardiac arrest and clamshell thoracotomy in flight: really?! There are crucial CRM points to consider between the doctor/crewman/pilot/paramedic; how would you manage these? Decision was made to land. Traumatic cardiac arrest protocol was followed in-flight and on ground. Cold intubation of the patient was difficult due to limited access. The patient was positioned north-south in the helicopter. 3 units of blood given, bilateral thoracostomies performed but patient remained in cardiac arrest. Cardiac ultrasound revealed cardiac standstill and evidence of cardiac tamponade with clots. Clamshell thoracotomy performed in the back of helicopter with relief of cardiac tamponade and ROSC. Post-procedure sedation, paralysis and TXA was given. 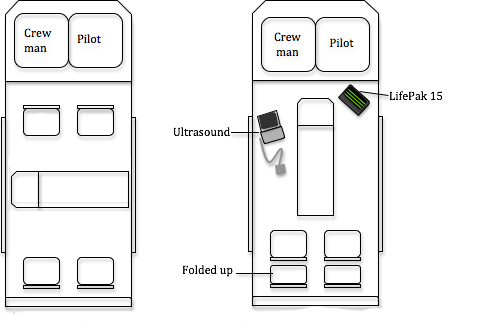 Move paramedic’s and doctor’s seats as far back in the cabin as possible facing forward and fold rear seats up (see representation below). Move patient stretcher a further 6cm south, moving secured equipment if required. CRM can help you make decisions. Discuss difficult problems with all your crew. To land or not to land: This is multifactorial depending on expected arrival to destination and aviation factors (weather, availability of landing sites). 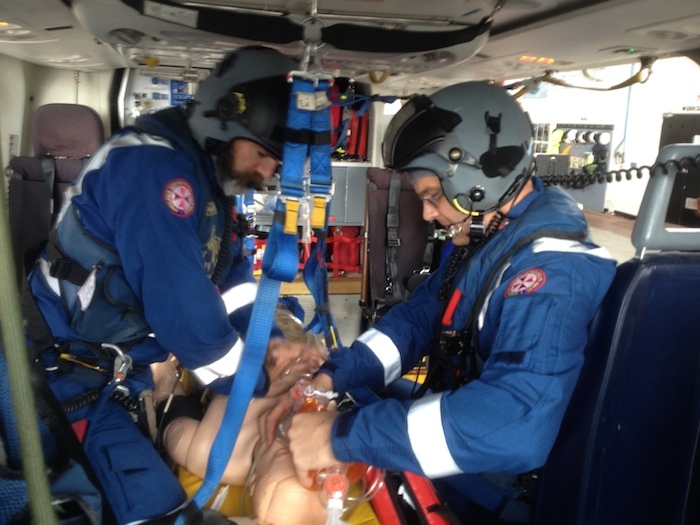 PRO – Frees up crewman and pilot to aid with fast/efficient treatment of the patient. Again: ANTICIPATE THE CLINICAL DEMISE OF YOUR PATIENTS! Management of traumatic cardiac arrest can be found on the HOPs here, with an excellent review of management found here. Thanks to Matt (Doctor), Phil (ICP), Pat (Crewman), Carla (STAR, Sim controller), Alex (Scenario orchestrator) Cliff (debriefer) and Bubba & Lucas (Experiential insight-providers). This entry was posted in Cases, General PH&RM, simulation, training and tagged education, HEMS, pre-hospital, Trauma. Bookmark the permalink.